Cristina Adriana Chiara Scabbia (Italian pronunciation: [krisˈtiːna adriˈaːna ˈkjaːra ˈskabbja]; born 6 June 1972) is an Italian singer and lyricist, best known as one of the two vocalists in the Italian gothic metal band Lacuna Coil. She used to write an advice column in the popular rock magazine Revolver, alongside musician Vinnie Paul. Scabbia is featured in a Megadeth song "À Tout le Monde (Set Me Free)". She also featured on "The Theory of Everything", an album from Arjen Anthony Lucassen's Ayreon project, with which she is cast as the Mother. She is also the featured artist in the Apocalyptica song "S.O.S. (Anything But Love)" and another version of the Alter Bridge song "Watch Over You". Her highest note ever hit is claimed to be an A7. Scabbia performed a duet with the Italian ex-singer of Linea 77 Emiliano Audisio on the track "Beautiful Lie" to be part of the soundtrack for the 2013 Italian film Passione sinistra. In 1991, Scabbia began singing professionally as a touring musician for other bands and providing backing vocals. Later that year, she met the male vocalist Andrea Ferro and bass player Marco Coti Zelati of Lacuna Coil in Milan's Midnight club. At the time, the band was named Ethereal, and Scabbia was first employed only as a session singer. She was employed to record backup vocals for the choruses of songs on their demo tape, but the band members liked the way the male and female vocals sounded together, and asked her to be a permanent member. After several changes in the band's line-up, the members were reduced to Ferro, Coti, Zelati and Scabbia. The members recorded a two track demo in May 1996, and were soon signed by the German branch of Century Media, eventually joining with the American branch of the label. 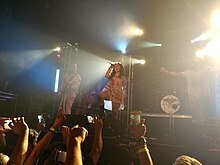 Once signed, the band changed their name to Lacuna Coil after learning that a Greek band signed to Century Media had already claimed the name Ethereal. Adding new band members, Lacuna Coil began , releasing their first album in 1997. ^ "Cristina Scabbia". Maxim. Archived from the original on 3 July 2012. Retrieved 26 February 2013. ^ "Cristina Scabbia Biography". biurams.com. Archived from the original on 9 January 2007. Retrieved 25 October 2006. ^ "Instagram Photos – Cristina Scabbia Official". Facebook. Retrieved 28 October 2013. ^ "Emiliano Audisio (ex Linea 77) e Cristina Scabbia duettano in 'Beautiful lie'". rockol. Retrieved 12 September 2013. ^ "Lacuna Coil's Cristina Scabbia Plays 'Wikipedia: Fact or Fiction?'". Loudwire. Retrieved 28 January 2016. ^ Cristina Scabbia (13 December 2002). "Lacuna coil interview with cristina scabbia" (Interview). Interviewed by Neon. neonblonde.com. Archived from the original on 7 March 2007. Retrieved 10 November 2007. ^ Cristina Scabbia (23 December 2006). "Interview with Cristina Scabbia (Vocalist)" (Interview). Interviewed by Kevin Karr. timesheroldonline.com. Archived from the original on 24 November 2007. Retrieved 10 November 2007. ^ Sharpe-Young, Garry. "MusicMight Biography". MusicMight.com. Archived from the original on 16 January 2013. Retrieved 9 November 2007. ^ "Cristina Scabbia Interview". Musicaldiscoveries.com. Retrieved 26 October 2006. ^ "Ethereal". emptyspiral.net. Archived from the original on 27 September 2007. Retrieved 10 November 2007. ^ "Cristina Scabbia to guest on Ayreon Theory of Everything". YouTube. 23 August 2013. Retrieved 28 October 2013. Wikimedia Commons has media related to Cristina Scabbia.